Fulton NY – Sixth graders across the Fulton City School District recently completed a mini unit on Medal of Honor recipients and they were surprised to learn that a native Fultonian earned that medal on June 6 1944. Carlton W. Barrett was born and raised in Fulton and joined the Army in 1940. On D-Day, he found himself on the beaches of Normandy, France, under withering fire in conditions reminiscent of the opening scene of Saving Private Ryan. Barrett, at only 5’2” and 125 pounds, swam struggling comrades into shore, and swam wounded soldiers out to evacuation boats. Additionally, he calmed panicked men and ran messages up and down the beach with no regard for his personal safety. He did all of this while disregarding three shrapnel and bullet wounds. Eventually, he was evacuated off the beach after a blast shattered the bones in one of his feet. A few years ago Volney Elementary School sixth grade teacher Bill Cahill was at a meeting when a colleague from Faigrieve, Rick Bush, showed him Carlton W. Barrett’s MOH citation. Discussions about what a wonderful example of character education Barrett’s actions were ensued. Surprisingly, none of the native Fultonians in the room had heard of Barrett. As the next few years passed, Cahill continually asked people around the district and community if they had ever heard of Private Barrett and the answer was consistently no. Then last year, Cahill came across an article entitled America’s Sad Story; Fulton NY. Cahill recently recounted how the article had sparked an idea. “The article really bothered me. My grandmother was a Fultonian and I am well aware of the city’s proud history. Unfortunately, the city had fallen on some tough times over the years, but the future is bright. I see it every day in our classrooms. After I read the negative article about Fulton, I immediately thought of Mr. Barrett and how he had become forgotten over the years,” Cahill said. As a result, the district’s sixth grade teachers obtained a DVD series from the Medal of Honor Society with lesson plans for educators that included web quests, writing activities and video testimonies from living MOH recipients. Students got to hear firsthand about recipients’ bravery, fortitude, perseverance, humility, selflessness and love for fellow comrades in battle. Once students started to watch first-hand recollections about the feats of valor the recipients displayed on the battle field and found out that a fellow Fultonian had earned the medal, they were very enthusiastic to learn more about Carlton W. Barrett. Students read an article based on research by Volney parent Carolyn Zimmerman about Barrett’s life in the military. Outstanding essays were then selected by teachers from each school. Essay winners will ride in Fulton’s Memorial Day Parade on May 27 and read their essays at a morning program at Memorial Park on May 29. This is a wonderful and thoughtful project for our school kids. We all know about our “now” hero’s, but knowing our historic ones is great. Thank you all involved and thank you students, your all great. This thank you comes from a family with a long list of service from the Civil war right on down to Afghanistan conflict. I’ve lived here since ’67, and I’ve seen our hero’s name in two places: on the street sign bearing his name and on the welcoming sign at the corner of Fay and 481. But it was better to read his name in a description of his heroics on D-Day! Thank you for keeping us free, Sir. 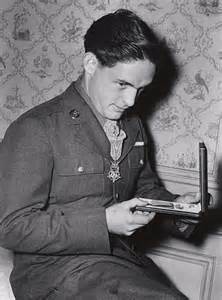 I had heard of Corporal Barrett and knew he was a Congressional Medal of Honor winner but I did not know it was due to his actions on D-Day. I had the opportunity to read some of the essays this past weekend as they will appear in the upcoming Fulton Memorial Day Salute advertising booklet. They were great essays and it’s wonderful the teachers undertook this project with their students. Bill Cahill is to be commended on demonstrating personal characteristics that can be emulated by all. He shows patriotism in his description of what drove our previous generation to rise to the cause of ridding the world of a scourge. The “common man, and woman” stepped up to the plate. These events of D-Day showed what this man of remarkable character, and courage did to support the mission, and to save many — all without regard for his personal safety and well-being. Bill has identified a problem in that the current generation is not being made aware of what America and Americans have done in the past, and has brought this incredible story of what a slight-of-build Fultonian did at one moment in history. By virtue of his unique position as a teacher, he is in a position to influence this deficit by influencing the students of his school. He has done so with perseverance, persistence, and thoughtfulness and is to be commented. I truly enjoyed this article. Fulton has many unknown people living in it that has in one way or another put itself on the maps! Very proud to be a part of Fulton NY.